There’s no need to panic if your system alarm activates. Here’s a short video explaining why your alarm might go off, how to silence it, and what to do next. Some systems have just visual or just audio; some systems have both in case the visual alarm is not located where the owner would easily notice its being activated, or in the event that one of the alarms is inoperable. If your alarm turns on, don’t panic — it is usually not an emergency. 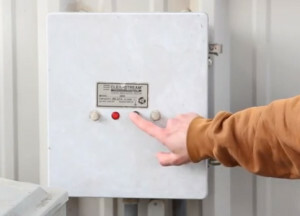 The sound may be loud, but you can silence the audio alarm by pressing the silence button; depending on your system, the alarm and/or silence button may be located on the a wall mounted control box or on the cover of the aerator box. Pressing the silence button stops the alarm’s sound, but doesn’t actually turn the alarm off — if your alarm has a visual component, you’ll see that the light will stay illuminated even when the sound is off. The light will stay on until the issue that triggered the alarm is solved. Why did my alarm turn on? There are an unlimited number of reasons why an alarm may activate — it is comparable to the “Check engine” light for your vehicle. It could be something small, or something major, but you really don’t know until the system is checked out. How can I find out what the problem is? Here is something you can check yourself: If you have a tablet chlorinator, see if it is clogged. If it looks clogged, try to clear the blockage and see if the alarm turns off (see our video on how to unclog your chlorinator). Note: Adding chlorine to your system will not make the alarm turn off. Next, check your home’s circuit breaker. If the breaker connected to your aerobic system has been tripped, set it back in place and see if the alarm turns off. If your chlorinator is not clogged and no breakers are tripped, call your maintenance provider and do not attempt any further troubleshooting on your own. Your provider may service your system immediately, or may request that you wait to see if the alarm stays on for 24 hours. If your system is on a timer, it may just be that it needs to spray or pump down after the timer turns on the pump; if this is the case, the alarm will turn off after it sprays or pumps down. Anytime your alarm is on for 24 hours or more, call your maintenance provider. If you have pressed your silence button, you may need to reset it by re-pressing it to turn it off of the silent mode for the next time the alarm comes on. Have more questions or need help? Visit our FAQ or contact us for assistance. If the red light is still on, then something needs attention. Sometimes its minor, sometimes its not. If you have already checked the breakers, then there’s not much else you can diagnose yourself in most cases. If you have a tablet chlorinator (with tabs not liquid bleach), then sometimes the chlorinator can get clogged up and you can clear it out with the end of a broom stick. The amount of water you use usually doesn’t have an effect on the alarm. If your system is still spraying out, then you can still use water in the house without backup, but the alarm still signals that there is something else going on. One common thing is if there is a problem with the air pump, which is needed to help the aerobic bacteria to live and treat your wastewater. I know you are trying to avoid repairs, but putting it off may have a domino effect and may cost you even more down the road. Best wishes! New aerobic system. A few months in alarm is constantly going on..float swtich error. Then some pump error. They come out replace pump under warranty. Say we need to rewire adding breaker for alarm. They installed the system!. So few months later its doing exact same thing. The alarm is plugged directly into outlet under the house the way they did it. Also if you slam the back door…alarm goes off. Its next to it…you move around while your on toilet in my bathroom it goes off…alarm is on other side of wall behind toilet. Im at my wits end.. Ive resorted to turning breakers on alarm off and then early morning back on…pump kicks on but it smells and i don’t know where or how to add chlorine. If i leave box on alarm goes off periodically. This sounds abnormal. I would suggest calling another company to see if you can get an inspection of the system, in writing. Was the system permitted? Plugging in alarms directly into outlets is not a common practice here but I don’t know what is allowed where you live. You could also just call the permitting authority to see what they suggest. They might come do an inspection for you and if the system was not permitted, then the installer may face some penalties, and gives you more ground to make sure the installer corrects whatever the issue(s) may be. Good luck! My aerobic tank says “Aerator problem” I tried searching what specifically that can be but can’t find anything. What does it mean? The aerator pumps oxygen into the system, but there could be many reasons that alarm may activate. Without knowing how to diagnose or repair it, you may cause further repairs to be needed. You need to call a local licensed professional for proper maintenance. 6 months ago, the alarm sounded on my system, Service provider put “kit” in the air pump. I did the math and bought a brand new pump in the event of needing a new kit, I can rebuild the original pump for much less. 3 weeks ago the alarm sounded again, I installed the new pump (Identical make and model) and ordered the re-build kit for the original pump. 2 weeks ago the alarm sounds again, Pump was not running, I found that the “Comp” breaker was tripped, I reset it and pump runs and alarm is off, this lasted 4 days and the “Comp” breaker tripped again. The system uses liquid bleach so clog is probably not the issue. Can you tell me what could cause the “Comp” breaker to continually trip? Our county does not require a maintenance contract and If I can fix it I will. Many things can cause the compressor breaker to trip. I know you want to be able to fix it yourself, but troubleshooting cant be done over the internet. It is best to get a technician with troubleshooting experience to find the cause of the problem if you want to get to the bottom of it. Hope this helps. Are you already in bed and not using any water when the alarm comes on at midnight? I would not turn off the system at all when your alarm comes on, only silence the buzzer, then see what happens. The system will not spray out every night…only when there is enough water to lift the pump float AND then wait until the timer allows it to pump out. If you happen to have enough water in the pump tank to lift the pump float, but the timer is not allowing it to spray (due to the time) and you use just enough water to lift the alarm float, then the alarm float will trigger the alarm. Then, once the timer turns on, then the system should spray down, then the alarm should turn off. If this happens regularly, your maintenance provider might be able to raise the alarm float to prevent unnecessary alarms due to this circumstance. But, if there are other factors involved, then you might want to go with his suggestions and see if that helps. It sounds like its probably related. I would definitely call a licensed maintenance provider to diagnose. We just moved into this house. Septic was inspected and everything was fine. The alarm has gone off a few times when the power went out or when we turned the water off to fix both leaking toilets. I don’t want to speculate why your alarm is on and stays on, so you really should have the installer (since its brand new) come check everything. There are LOTS of reasons an alarm can activate. I could throw out some ideas but it won’t resolve anything until you have it checked and know for sure. And the alarm went off again this morning. Aerobic System alarm went off but the light is not on. I pressed the silencer but the alarm sound continues. It is too late for a service call. What would cause this issue? If the light is not on, maybe the bulb has burned out. But I’m not sure why the buzzer continues after you press the silence button. There could be many reasons your alarm activates in the first place. Once its normal business hours, contact your maintenance provider. I’ve read through all of your replies and haven’t found anything on problems after a rainstorm. My whole above ground unit was inundated under a pond last night and the alarm was on when we woke. Its likely that rainwater may have entered the tanks and caused the high water alarm to come on. In this case, the system should pump out the water. If the system has a timer, it may not spray down until the night time. If you alarm is on the following morning, call your maintenance provider. Likely, it just needs to spray down. We had storms come through our area. We did have some power flickering but never lost power. Now our alarm is going off. I went out and silence the alarm. I have reset the breakers in the control box that didn’t work. I reset the breaker in the house for the system and that didn’t work. What else can I do to fix my system before I call someone to come out. It sounds like you’ve checked everything you could without a professional doing some diagnosing as it may have shorted out something in the control box or caused adverse effects on the pump, etc.. At this point I would recommend to call a licensed and experienced aerobic system technician. Yes! All the compartments/tanks to an aerobic system should be pumped everytime in most cases. There are a few exceptions, like if none of the tanks have solids, but one tank needs to be pumped for repairs, etc. But, if you are pumping it to remove the solids, then you’ll want to pump out all the tanks/compartments. There are a lot of companies that don’t pump out the trash compartment because it may be buried, but this leaves the job unfinished and sludge accumulates higher faster in the other tanks because it was not all pumped. There are many reasons an alarm can come on, and it may not even be related to the tanks being pumped out. I’m not sure what “white water tank” is referring to…it sounds like your actual aerobic tank? Whitewater is also an aerobic brand…so a little clarification might be helpful. However, if it was your aerobic tank that was pumped. I don’t know all the specifics needed to answer your question, but this might help: Whenever we pump an aerobic system that has a liner type aerator/compressor, the aerator needs to be turned off prior to pumping, then turned back on after the aerobic tank is filled. The change in air pressure and the empty tank can affect a linear aerator and cause the diaphragms to blow out. I’m not saying this is your case, but it might be. If the levels aren’t high enough in the tanks to reach any high-water alarm float, then it sounds like it might have to do with the aerator. Is the aerator running? Is the power turned on to the system? If the power is on but the aerator is not running, then that’s likely the issue. A lot of pumping companies do not also do aerobic maintenance, so they may not know what is needed for your brand when being pumped. I’d call an actual maintenance technician to find out what the problem is, then go from there. How do I check pump operation and spray nozzle operation. System has a pump test button but it does nothing. When you lift the pump tank lid, if the level is not high, then your pump is likely working. To make it manually activate can be complicated – there are so many different set ups. If the system is sprays on-demand, and if it has a pump float, you could lift the pump float for the pump to activate. If you have a timer, photocell, or don’t have floats but have sensors instead, the process should probably be done by your service provider. My septic air pump went out yesterday and I have ordered a replacement online. How long can my septic system safety go without aeration? Would a couple of days without the pump be harmful to my system? The less amount of time that passes, the better. The aerobic bacteria in the tank requires oxygen to live. Once the bacteria population dies off, you may notice odors and an increase in the amount of solids in the system (this could lead to needing the tanks pumped if it goes too long). Once the aerator is replaced, the odor should dissipate within a few days to a week. I live downhill from a lot of homes. With all the snow melting my ground is saturated and I have small rivers. I have an above ground mound, but the tanks are underground. I woke up yesterday to my high water alarm going off. I have the pump on, but the aerator will trip a little button under it. I see the last tank has water to the neck of the tank. We also got a lot of rain today and now getting snow. Should I give it time to try to empty? This happened over 5 yrs ago during a huge rain storm, and the service guy came out, asked me for an extension cord and plugged it into the last tank and left. He said remove it and re-plug in the system once water is low. I spent over $250 for him to connect the system to my extension cord and don’t want to waste money again if I can ride this out of fix myself. I just don’t want to ruin the system. We don’t install mound systems like what you are explaining, so I’m not sure how to best answer your question. You could try to give it time to empty if you think that is the problem. Otherwise, you might want to call the installer or the last service person to ask for better advice. Hello. We recently purchased a fixer-upper home that came with a great aerobic septic system. Unfortunately someone tripped the air compressor and no one noticed. It may have been turned off for 3 or 4 weeks. I’ve turned it back on. Will it eventually become aerobic with the pump on or do I need to add aerobic material to the system? Thanks! The system will repopulate with aerobic bacteria after several days to a week, if you guys are living there. If the house is vacant, it may not re-populate until you move in. If this has affected the sludge levels, then you may need to pump it – but only a professional will be able to determine this. You could pump it anyway, it wont hurt anything, but then you may spend money when its not needed either. My Cajun Aire system throws the (15 amp) circuit breaker off continually. The ‘pres air trol’ switch is broken will this cause the breaker to trip? The circuit breaker is designed to protect the electrical circuit from damage due to an overload or short circuit. If the switch you mentioned is on the same circuit of the continuously tripping breaker, then that would be a likely cause. A system schematic would help you trace the circuit to determine the fault. Make sure you turn off any breakers before replacing any electrical parts on your system. If you are unsure or not comfortable with electrical repairs, please call your local provider or an electrician.